American Entertainment Magazine - Are We Having Fun Yet? Jon Wee and Owen Morse deliver comedy entertainment with a powerful message, creating an unforgettable experience for audiences in any industry. You put on a great meeting last time, but now you have to top it. You need something unexpected, unique and fresh. Enter The Passing Zone!!! Here you find something different. You find roaring chainsaws, cheering attendees, flaming torches and knives flying through the air! You find a surprising experience. And you find genuine laughter. You find two grown men who demonstrate partnership by leaping around the stage in fuchsia leotards, with rapid-fire banter, throwing sickles around the body of someone from the audience as they receive a standing ovation. You find three of your people in astronaut suits flying through the air. You find risk-taking, laughter, and an inspirational experience your people will never forget. 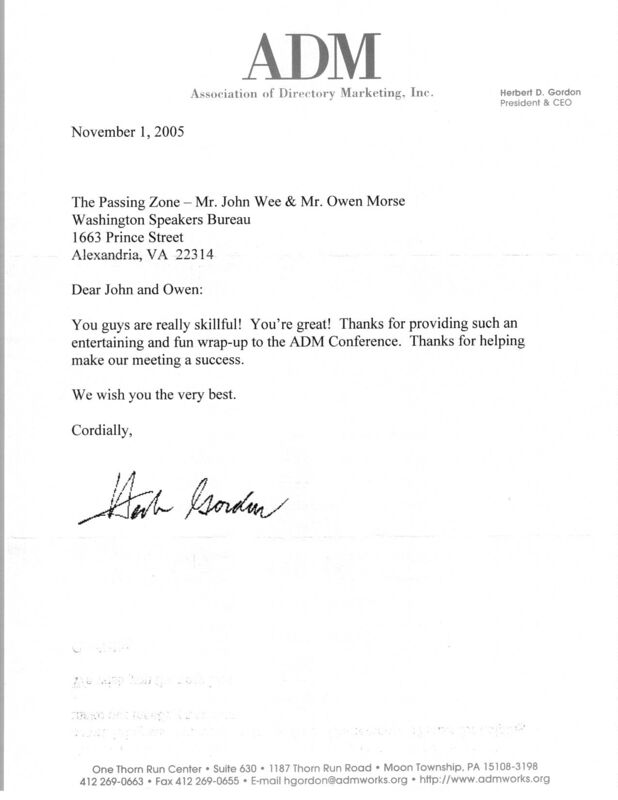 Jon Wee and Owen Morse have one of the longest standing partnerships in corporate entertainment, a true demonstration of The Power of Partnership. 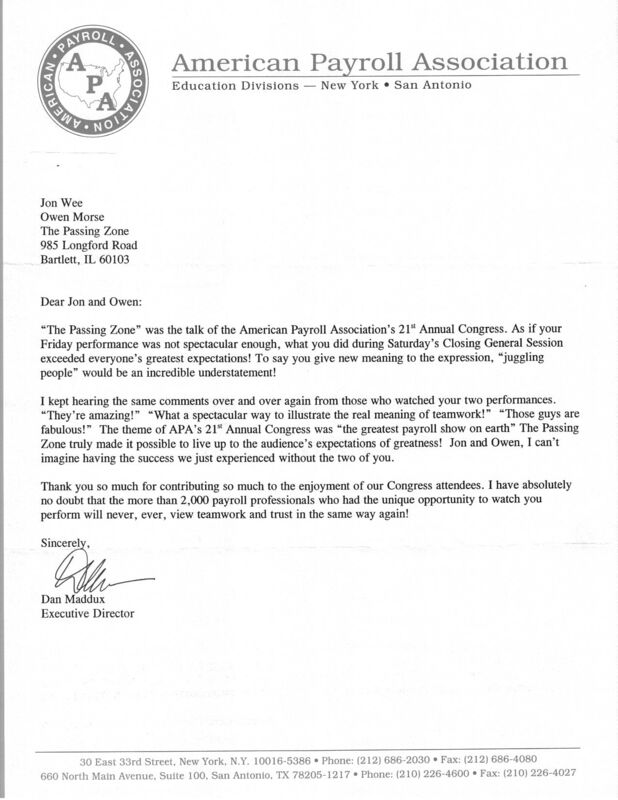 The message they deliver has such impact that in July of 2010 they were inducted into the Speaker Hall of Fame (CPAE Award, from the National Speakers’ Assn.) 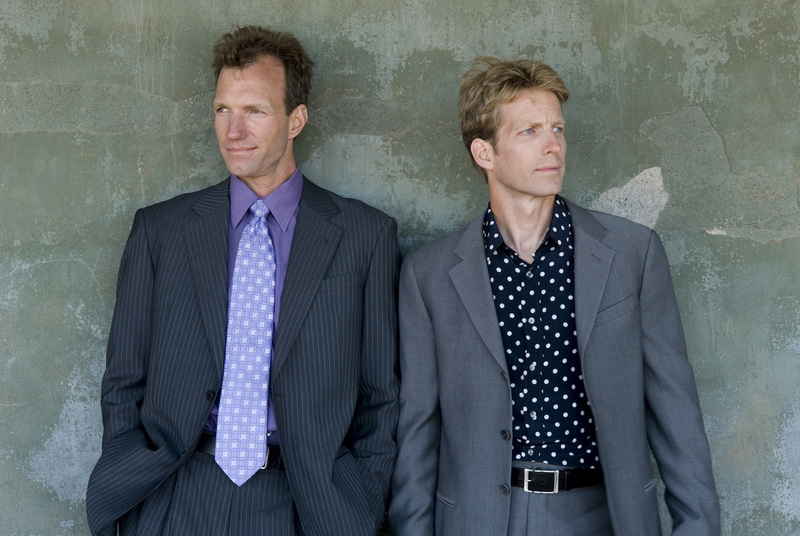 They have appeared on The Tonight Show, The Today Show, and they were finalists on America’s Got Talent. They are at the top of their craft, with performances at the White House, in London for Prince Charles, and in the motion pictures The Addams Family and The Aristocrats. Add the Just for Laughs Comedy Festival, MADtv, AOL’s “TV’s Top 5,” The Wall Street Journal, the Jerry Lewis MDA Telethon, four Guinness World Records, their own theater show, “Gravity Attacks!” and you have one of the world’s top comedy acts working today. They are bona fide experts on working together effectively. Jon and Owen depend on one another; their success - even their safety - is determined by how well they execute together. Your people will walk away inspired to innovate, collaborate and execute - and with a sore face from laughing so hard. IMAGINE the impact this can have on your organization. 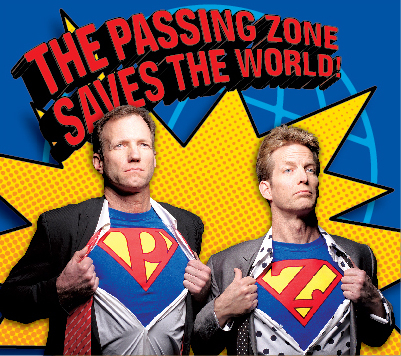 Wait, don’t imagine it, EXPERIENCE it…with The Passing Zone! 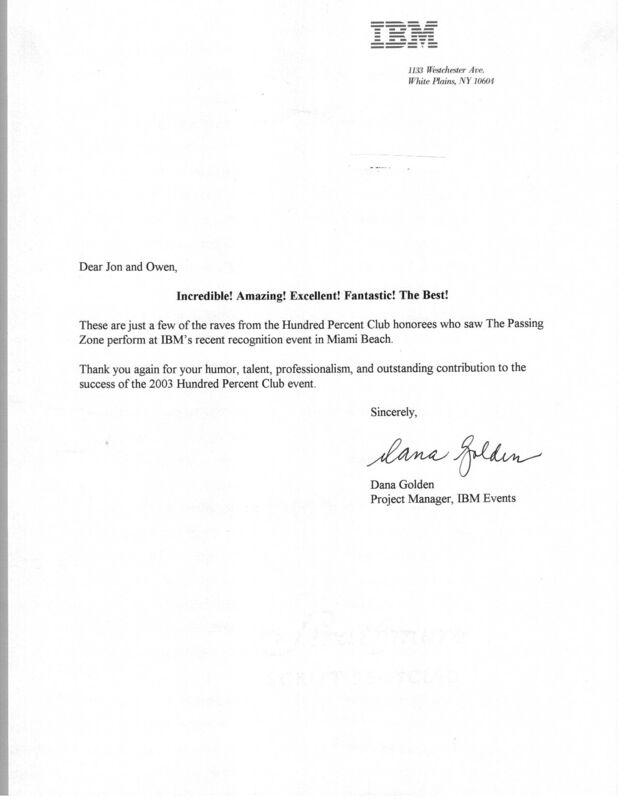 “The Passing Zone was fabulous! They were a big hit with all attendees and helped make the conference a tremendous success. 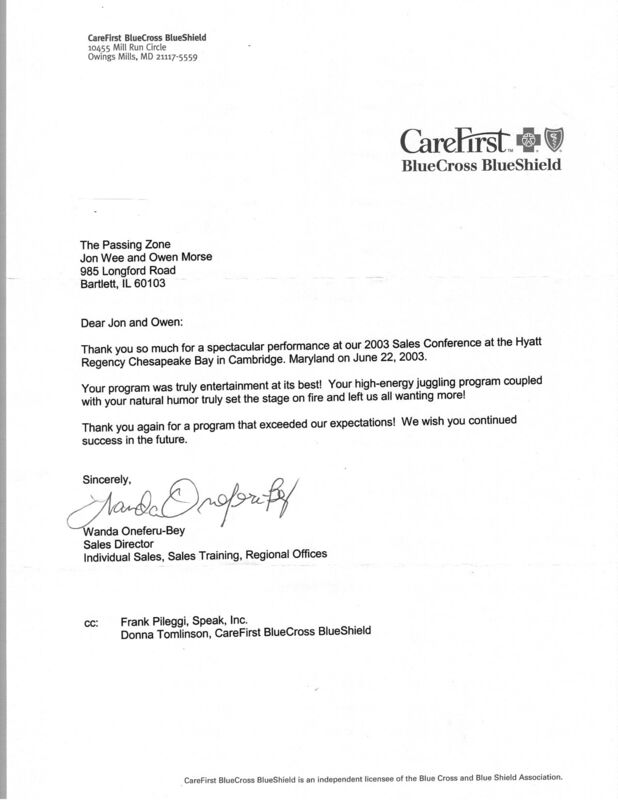 They were just perfect for our conference and the juggling session after their presentation was a success as well. They are terrific!” Freddie Mac. Jon and Owen don’t just talk about teamwork - they DO it. The Passing Zone shows your people how to be a high-performance team. It takes trust, cooperation, communication, and practice. 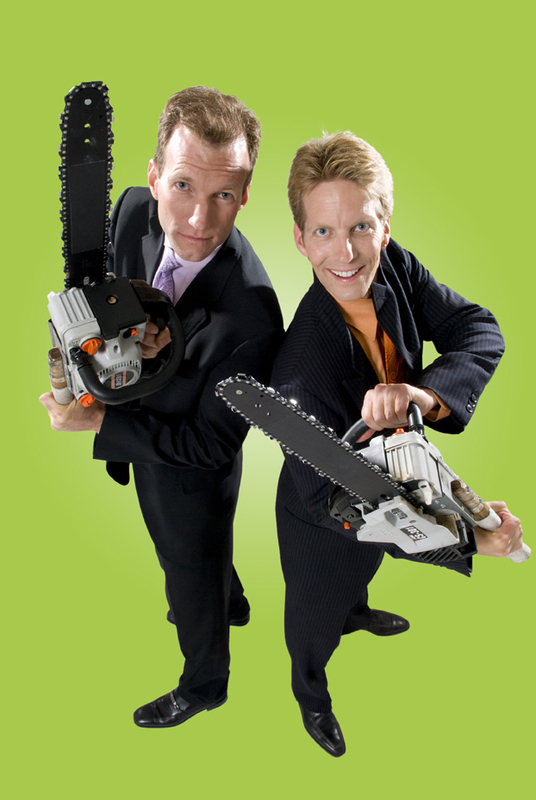 Chainsaws fly though the air, audience members become part of the team, and your group will laugh, gasp, and wipe tears from their eyes during this hilarious keynote from one of America’s most dynamic performing duos. If your people could surprise themselves by learning to juggle in less than an hour, do you think they might have a new outlook on the challenges that lie ahead at work, and in all areas of their lives? Would a group that had just spent an hour laughing together, helping one another, cheering each other’s success, walk away a stronger team and more dedicated to each other’s success in the workplace? Would they enjoy the gift of juggling balls, and would they put them somewhere in their home or office where they would constantly be reminded of the great time they had at their event? And would they be able to impress and entertain others with this new skill for the rest of their lives? Would The Passing Zone bring an added level of learning and fun to your event by leading your group in The Juggling Experience, a hands-on workshop that increases the impact Jon and Owen will have at your event? If your group has not experienced The Passing Zone, it’s time to change that!